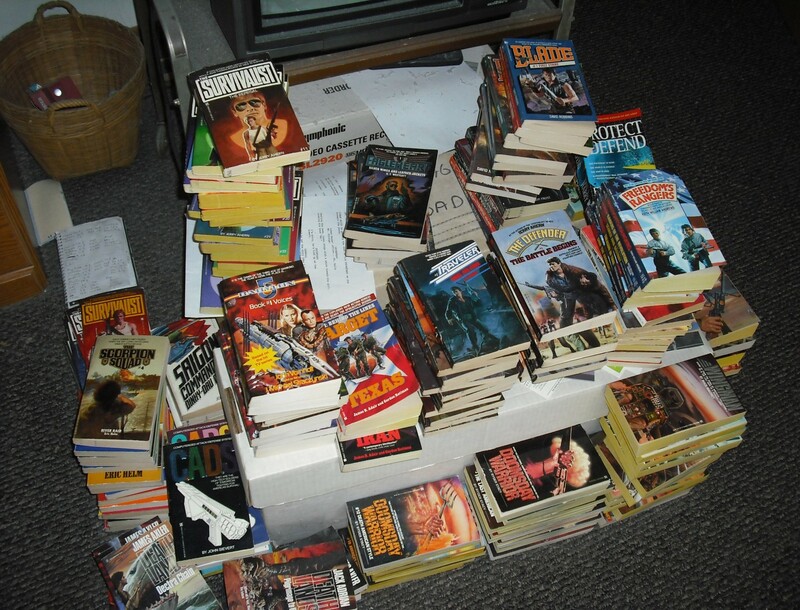 Amtor – THE BOOKS THAT TIME FORGOT. Carson sets off with Ero Shan to return him to his home city of Havatoo. Along the way they get involved with a land that is under the control of Morgas. Morgas is somewhat of a charlatan in his claims to being a great wizard. Carson uses his considerable telepathic powers to defeat him. 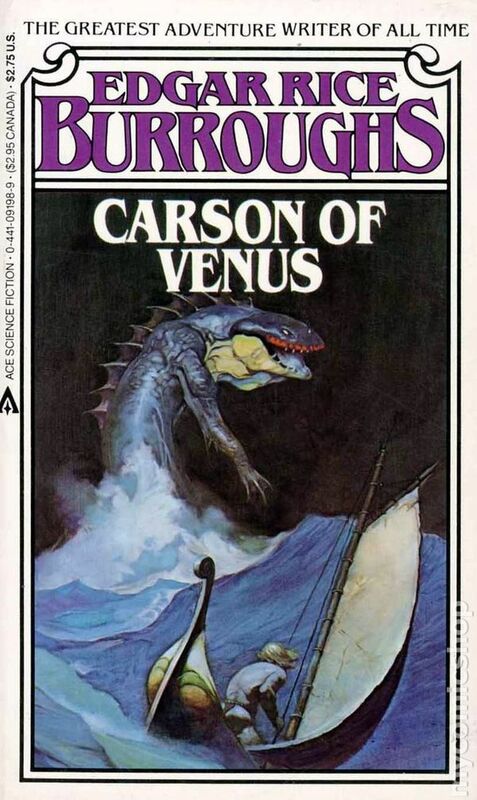 This is the final story of Carson of Venus. It is an interesting story. In the first book it is established that Carson learned the power of telepathy while a boy in India. This is how he communicates his stories to Burroughs. This story he finally uses these powers. I am not sure why he didn’t use them before except that maybe these powers make it too easy to get out of difficult situations. My final thoughts on the Venus series. I think they were one of the best. Carson seemed to be a character I could relate to. The world he created for Venus had endless possibilities for exciting stories and adventure. John Lafitte is a motorcycle cop in southern California. While trying to make an arrest he is trapped on a dirigible and ends up in the south Pacific. There he falls into a gang of pirates. He works his way to second in command and eventually falls in love with the leaders woman La Diablesa. This is an interesting short stand alone story. A major theme is that heredity sort of determines ones destiny. Lafitte had a famous ancestor who was a pirate and life threw him into the profession. I don’t really believe that heredity determines a persons outcome. I will admit thought that it can influence a person. I myself am aware of certain traits both negative and positive that I seem to share with my parents. Carson has rescued Duare from Vepaja and are heading back home to Korva. A great storm blows their plane into the unexplored northern hemisphere. Here they become captives of the Myposians. Myposians are fish like people that keep regular humans as slaves. They successfully escape and make their way south. The next major obstacle is a city of strange amoeba people that reproduce by splitting in two. The two are captured and put in the museum by a drug that freezes them from the neck down. While there they find that Ero Shan, a friend from Havatoo, is also captured. One of the inhabitants falls for Duare and they use that to gain their freedom. The third obstacle is a war in a land where the countries use giant land ships to fight their wars. After reuniting and escaping they finally make their way to Korva. The fourth book in the Venusian series is another exciting book. 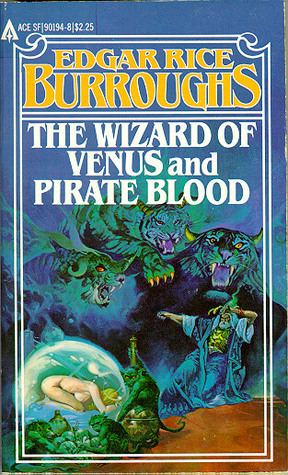 It is four stories combined after Burrough’s death and are probably the best in this series. There are a lot of strange civilizations and creatures. I highly recommend this book. Carson and Duare have escaped the city of Havatoo in an anotar(airplane literally bird ship in Amtorian). They can’t return to Duare’s home of Vepaja due to her violating the ancient laws by choosing her own mate. Thus the two go in search of a new home on Amtor. There wandering take them to the land of Korva. Korva has suffered a humiliating defeat in a war and suffered harsh punitive terms. The government has fallen to a fascist movement called the Zani and the last free city of Sanara is under siege. Carson befriends an agency from Sanara on a mission behind enemy lines and takes him to Sanara. Tamen is in line to be jong and the current jong Muso was threatened by Taman’s popularity and sent him on a mission to fail. Carson volunteers his services and his anotar begins a bombing campaign on the besieging Zani. Muso has developed an obsession with Duare and sends Carson on a spy mission to Amlot the capital. Once there he is befriended by a woman who gets him a position in the Zani guard. What follows is political intrigue and a plan to foment a counter revolution. Carson succeeds in overthrowing the Zani and exposing the traitor Muso. For his service he is adopted by Taman and becomes the prince of Korva. Unfortunately Duare thought him dead and has left for Vepaja with her father. Carson sets out to rescue her. 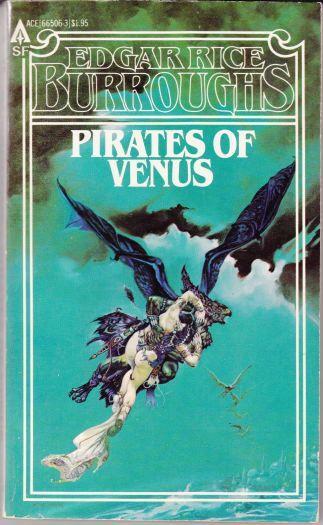 The third book of the Venus series is another excellent series. It focuses on war and cloak and dagger intrigue instead of exploring and fantastical monsters as the previous books did. The story has a satirical take on Nazis and Fascists. The Zani are clearly based on Hitler and the Nazi. They are described as thugs and have an extensive secret police to spy on every citizen. Everyone has to go around and greet each other with “Maltu Memphis”. When the leader Memphis passes in the street all males must stand on their head and shout “Maltu Memphis”. Everybody is also required to at least once a month attend a play on the leader’s life. This is the only theater allowed. The story definitely shows the narcissistic elements of Hitler and Mussolini. The last book left Carson captive of the Thorists with Duare escaping. Unfortunately Carson finds that she has been recaptured and they are both prisoners of Kapdor. Carson is condemned to die in the Room of the Seven Doors. A fiendish setup where the captive has seven doors to choose from for freedom. Six of the doors have a gruesome death waiting behind them. Carson outwits the room and escapes the city with Duare. They get lost in a storm and find themselves in an unexplored region of Venus. Here they are captured by Skor the Jong(king) of Morov. Skor is a scientist who has found the secret of reanimating the dead. Morov is a zombie city of the dead. Carson escapes to the neighboring city of Havatoo. Havatoo is a highly advanced and civilized city. Its people are happy, healthy and crime free. They achieved it by cleansing all people with undesirable genetic traits. Carson is tested and found to have theses genes. Sentenced to death, he is pardoned when they find out his knowledge of astronomy and how to build an airplane. One night a friend is kidnapped by the undead from Morov. Carson discovers a secret underground passage to Morov. He infiltrates the city and rescues both his friend and Duare. Duare is found to also have undesirable genes so Carson escapes with her in his newly build airplane. Duare declares her love for Carson. 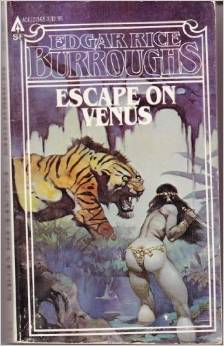 The second book in the Venus series is another worthy read. Havatoo and Morov are interesting contrasts in extremes. The book is definitely another exciting chapter in Carson’s adventures on Amtor. This is the story of Carson Napier and his ill fated attempt to reach Mars. Carson is disillusioned with life and longs for adventure. So he uses his fortune to create a rocket to propel him to Mars. Unfortunately the scientists forgot to include the Moon in their calculations. Instead the rocket is thrown off course and heads the other way. It instead crashes on the planet Venus. Here Carson finds a world of massive trees that stretch into the upper cloud cover. He finds himself the prisoner of a race of people that live in a city in these trees. The Vepajans are an advanced culture and eventually teach Carson their language and accept him into their society. The Vepajans are all that remain of a great empire. Their empire was taken over by Thorist revolutionaries and the upper class was forced to flee to their present tree island. Carson decides to accept an apprenticeship in gathering Tarel. Tarel is the strong web of a giant spider. On his first outing with his friend Kamlot the two are captured by birdmen. They are taken to the Sofal which is a Thorist ship looking for captives. The Thorists after killing and driving off all the educated must find doctors to manufacture the serum of longevity. This serum grants near immortality and the Thorists are desperate to regain it. Carson leads a mutiny of the prisoners and the dissatisfied crew and turns the Sofal into a pirate ship. They capture a ship with one of the oligarchs of Thora. They also free the princess of Vepaja. The customs of Vepaja demand that the princess can have no contact with anyone outside her family until she is married. When she reaches nineteen she is to be married to a noble. Carson doesn’t let a threat of death deter him from declaring his love for her. The Ongyan Mooska conspiring with traitors and the birdmen kidnap Duare the princess during a storm. Carson is washed overboard and makes it to shore. There he save Duare from savages and must fight off approaching Thorists. 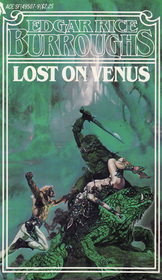 The first book in the Venus series or Amtor as its inhabitants call the planet. This is probably my favorite series after the Martian ones. It has the expected exotic civilizations, swashbuckling adventure and strange creatures. The Thorists are clearly meant to represent Communists. Carson is my favorite Burrough’s created character. Most of Burroughs characters are somewhat wooden. Tarzan is taciturn and Carter has that smug “I am the greatest swordsman that ever lived” attitude. Carson is one that has a genuine personality. He makes jokes and in somewhat of a screw up. He’s someone I can relate to. It shows that Burroughs has grown as a writer with this series.